It’s a common theme on astrobites that massive stars play a far more important role in galaxy evolution than one might casually assume based on their numbers alone. One of the main reasons massive stars are so important is their copious production of radiation that can ionize hydrogen gas. 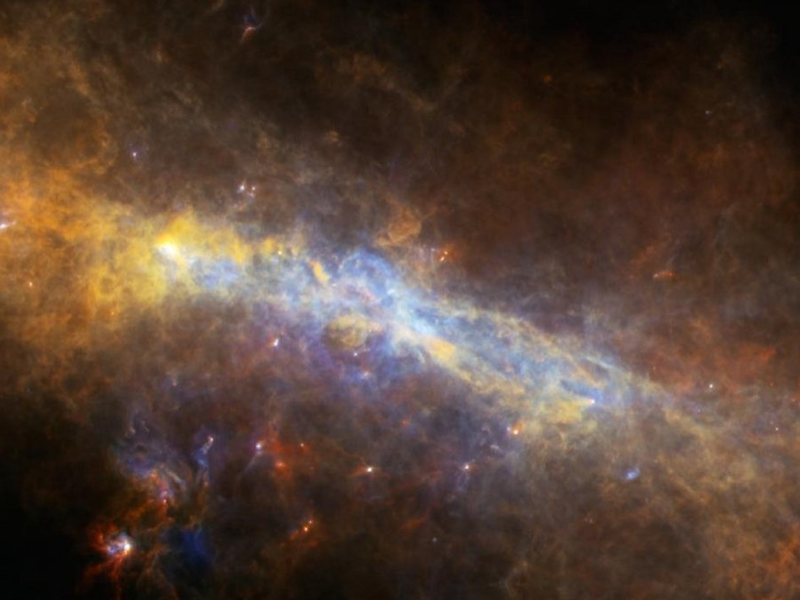 These energetic photons can photoionize and photodissociate atomic and molecular gas, creating hot, ionized gas that will not collapse to form new generations of stars. The hot, overpressured gas created by ionization, which astronomers refer to as an H II region, drives an ionization front capable of sweeping up and stirring gas throughout a star forming region. 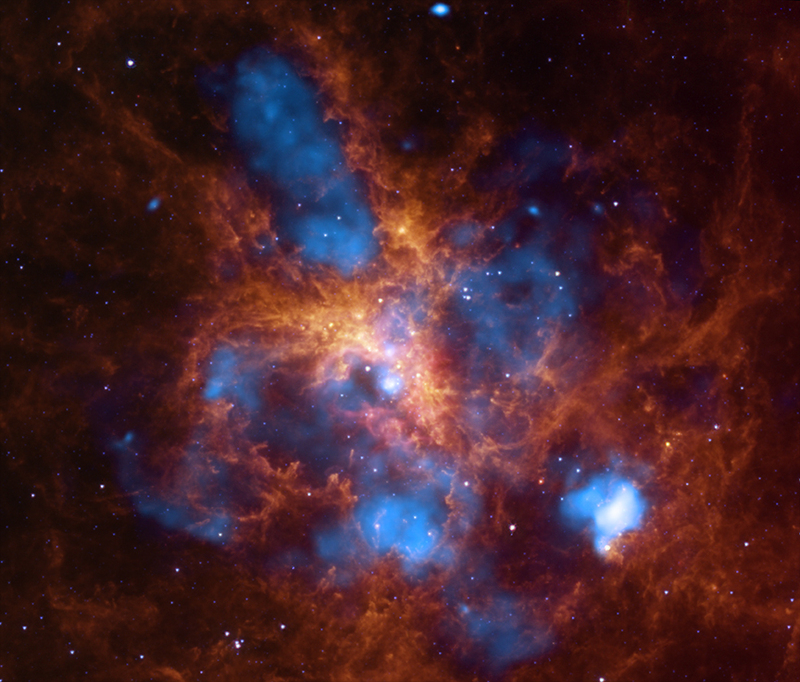 For particularly massive star clusters, which may contain hundreds or thousands of massive stars, the ionized region surrounding the central cluster, can extend for many hundreds of parsecs, visible to us as beautiful nebulae, like the 30 doradus star forming region in the Large Magellanic Cloud (at right). 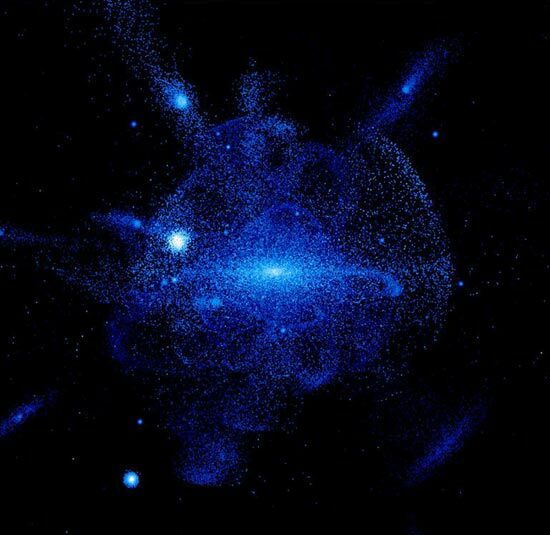 Massive clusters can also directly ionize intergalactic space, producing the diffuse ionized IGM that we know has been in place since the universe was about a billion years old. Today’s astrobite takes a close look at our nearest galactic neighbors, using a novel technique to infer the state of ionized gas and ionizing photons the Magellanic Clouds. Pellegrini and collaborators make use of imaging of the Magellanic clouds in narrowband filters centered on two emission lines of oxygen and sulfur. These particular emission lines are produced when twice ionized oxygen and singly ionized sulfur recombine in hot, low-density gas typical of the interiors of H II regions. In astronomical spectroscopist notation these two lines are referred to as [O III] and [S II], respectively (the number of roman numerals count the ionization state, starting at one for a neutral species). For gas that is unshielded from the hard ionizing field of a massive star, most of the oxygen and sulfur exists as O2+ and S2+ and all of the hydrogen exists as ionized H+. Near the edge of an H II region, the oxygen, sulfur, and hydrogen begin to recombine into O+, S+ and H0. While it would be best to trace the ionization state of the bulk of the gas using hydrogen, it is difficult to use recombination lines of hydrogen, like the Balmer Hα line, since hydrogen is constantly recombining and dissociating throughout the interior of an H II region. Looking at images of [O III] and [S II] emission can help break the degeneracies inherent in only looking at Hα emission. Two H II regions in the Magellanic Clouds. These images depict the ratio of S II to O III emission. The region on the left is optically thick to ionizing radiation and shows a shell of S II emission characteristic of the optically thick edges of H II regions. The region on the right is optically thick on the northwest side but is optically thin on the southeast side. 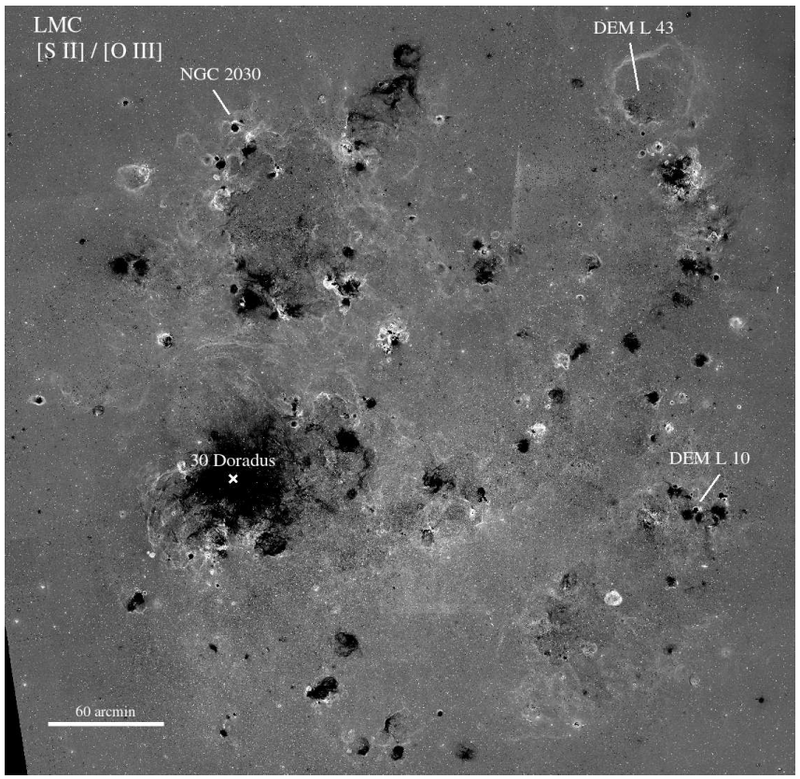 The narrow-band imaging was obtained by the Magellanic Clouds Emission Line Survey, which imaged both Magellanic clouds at sub-parsec resolution in Hα (6563 Å), [O III] (5007 Å), and [S II] (6724 Å) at the 1-meter Curtis Schmidt Telescope in Chile. After carefully flux-calibrating the images – a step that introduces the largest source of systematic uncertainty in the whole analysis – the authors take the ratio of the [S II] and [O III] images to produce greyscale photos like the ones above and below. In these images, regions that are bright in [O III] relative to [S II] (i.e. the optically thin interiors of H II regions) appear dark, while regions that are bright in [S II] relative to [O III] appear bright (i.e. the order-unity optical depth shells at the edges of H II regions). By identifying roughly spherical regions with [O III], the authors construct a new catalog of H II regions. Regions that are bounded by [S II] emission correspond to optically thick H II regions out of which few ionizing photons escape. Regions bounded on only one side by [S II] emission are identified as blister-type H II regions, optically thick on one side but optically thin on the other. Many regions are not bounded by any [S II] emission at all; these are optically thin H II regions which leak ionizing radiation into the bulk of the atomic interstellar medium of the two galaxies. S II/O III ratio image of The Large Magellanic Cloud. Using the new catalog of H II regions, the authors estimate the number of ionizing photons escaping from all of the H II regions in the two galaxies. 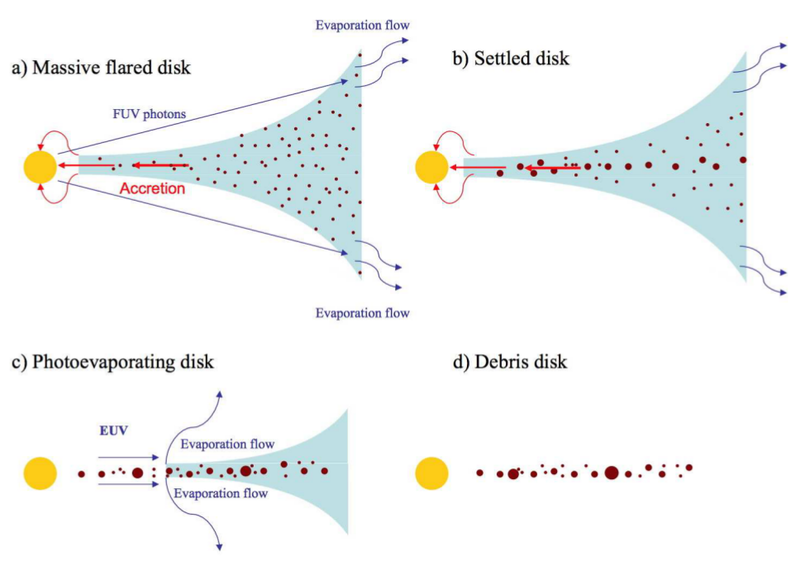 The authors find that the fraction of ionizing photons which escape from H II regions, fesc, correlates with the ionizing luminosity of the central star cluster. Perhaps unsurprisingly, the most luminous star clusters tend to be optically thin, probably because the luminous clusters can more readily ionize the bulk of the gas in their surroundings. Interestingly, the bulk of the escaping ionizing photons come from the most luminous clusters: R136 at the center of 30 Doradus in the LMC, and NGC 346 at the center of the N66 nebula in the SMC. Accounting for unseen field O-stars, the authors estimate that of order 10-20 percent of the ionizing photons produced inside the two galaxies are able to escape into intergalactic space. If galaxies in the early universe formed stars in the same way as the LMC and SMC, then the universe could have been easily reionized by photons escaping from H II regions.